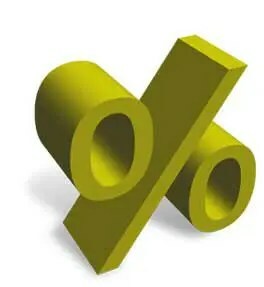 The above introductory comments are edited excerpts from an article* by Scott Grannis (scottgrannis.blogspot.ca) entitled The outlook for interest rates. …The market thinks the Fed is almost certainly going to end the tapering of QE3 in October, and about six months later, give or take a few months, the Fed is expected to start raising short-term rates. They will probably do this by increasing—very slowly—the interest rate they pay on bank reserves, using reverse repo transactions, and by not rolling over maturing Treasuries and MBS. The Fed is expected to raise short-term rates in a very gradual fashion beginning next year, and five or so years from now rates are going to be topping out around 3½ to 4%. There’s nothing very scary about this. 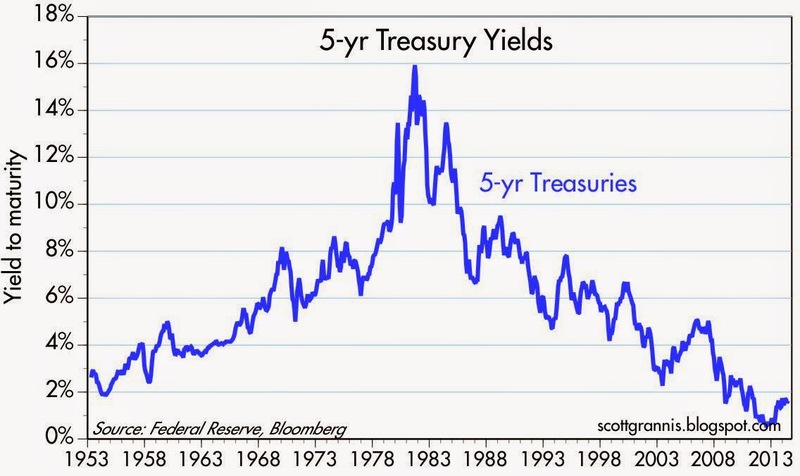 As the graph below shows, for most of modern history 5-yr Treasury yields have traded well in excess of 3%. That 5-yr yields today aren’t expect to rise above 4% for as far as the eye can see is pretty unusual from an historical perspective. the market doesn’t think that inflation has much chance of exceeding 2-3%. In other words, the bond market today seems fairly convinced that growth will be sluggish and inflation will therefore be tame for as far as the eye can see. also consider an increased exposure to equities, since stronger growth and higher inflation should have a positive impact on future expected cash flows. For my part, I acknowledge that I have been overly concerned about rising interest rates for most of the past 5 years or so. Being wrong for so long is humbling, but it is not a reason to shy away from worrying about a faster-than-expected rise in interest rates today. In the end, it’s all about what happens to the economy and to inflation. I’m still an optimist on the economy, since I think the market’s growth expectations are overly pessimistic. I think 5-yr real yields on TIPS tell us a lot about the market’s underlying expectations for real economic growth. As the graph above suggests, the current -0.38% real yield on 5-yr TIPS points to economic growth expectations of perhaps 1% per year, which in turn is a bit less than we’ve seen in recent years. If the market were convinced that future growth would be a solid 3% a year, then real yields today would be a lot higher than they are now. I’m still more worried about inflation than the market is, since I think the market is being a bit too complacent about the inflationary potential of the Fed’s massive balance sheet expansion and the Fed’s ability to reverse course in a timely fashion. As the graph above shows, the market expects CPI inflation over the next 5 years to average a mere 2.1%, which is actually less than the 2.3% it’s averaged over the past 10 years. I’m not predicting hyperinflation or anything like it, I’m just saying that expecting inflation as usual for as far as the eye can see despite the Fed’s huge and unprecedented experiment in quantitative easing is a bridge too far for me.There’s nothing scary about expecting interest rates to rise more than expected. Rates aren’t likely to surprise on the upside unless real growth expectations and/or nominal GDP expectations rise, and given the pessimism inherent in the market’s current expectations, either one of those would be very welcome developments. Interest rates are a good barometer of the market’s expectations for growth and inflation. That they are still so low today means that the market holds little hope for any meaningful improvement in the outlook for the economy and/or any meaningful rise in inflation. We’re living in a slow-growth, low-inflation world for now, and—as often occurs just before something hits us from left field—the market is extrapolating that today’s conditions will prevail for as far as the eye can see. 2. Inflation or Deflation: Are We Approaching the Tipping Point? Next Does Size (Market Cap) Matter?